Genevieve Bergeron: Second-year scholarship student in mechanical engineering. Played the clarinet and sang in a professional choir. In her spare time played basketball and swam. Helene Colgan: Was in her final year of mechanical engineering and planned to do master's degree. Had three job offers and was leaning toward accepting one from a Toronto-area company. Nathalie Croteau: Another graduating mechanical engineer. Planned to take a two-week vacation in Cancun, Mexico, with Colgan at the end of the month. Barbara Daigneault: Was to graduate at the end of the year. A teaching assistant for her father Pierre Daigneault, a mechanical engineering professor with the city's other French-language engineering school at the Universite du Quebec a Montreal. Anne-Marie Edward: Loved outdoor sports like skiing, diving and riding and was always surrounded by friends. Was studying chemical engineering. Maud Haviernick: A second-year student in metallurgical engineering and a graduate in environmental design from the Universite du Quebec a Montreal. 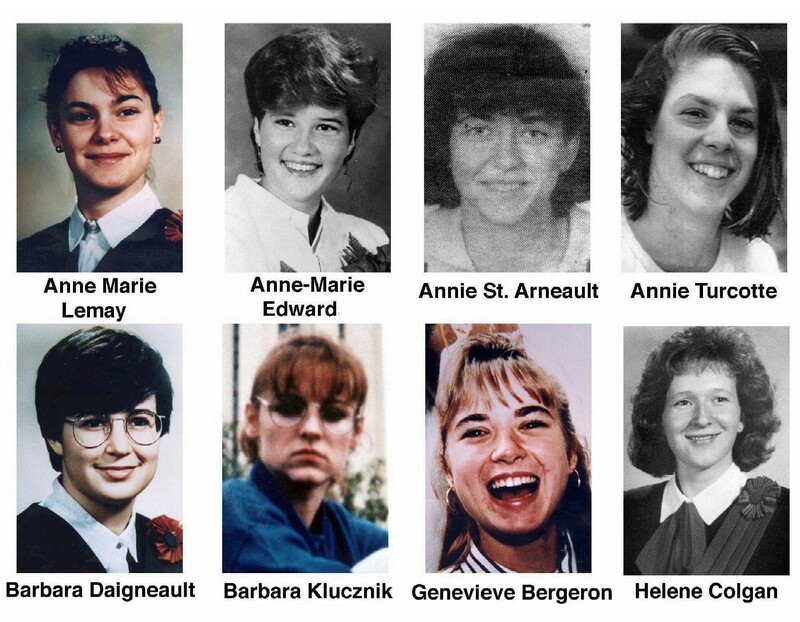 Eight of the 14 women slain at École Polytechnique are pictured, from top left: Anne Marie Lemay, Anne-Marie Edward, Annie St-Arneault, Annie Turcotte, Barbara Daigneault, Barbara Klucznik, Genevieve Bergeron and Helene Colgan. Barbara Klucznik-Widajewicz: A first-year nursing student. Arrived in Montreal from Poland with her husband in 1987. Maryse Laganiere: The only non-student killed. Worked in the budget department of the engineering school. Had recently married. Maryse Leclair: Was in fourth-year metallurgy, had a year to go before graduation and was one of the top students in the school. Acted in plays in junior college. The first victim whose name was known and she was found by her father, Montreal police Lt. Pierre Leclair. Anne-Marie Lemay: Was in fourth-year mechanical engineering. Sonia Pelletier: The head of her class and the pride of St-Ulric, Que., her remote birthplace in the Gaspe peninsula. Had five sisters and two brothers. Was killed the day before she was to graduate with a degree in mechanical engineering. Had a job interview lined up for the following week. Michele Richard: Was in second-year metallurgical engineering. Was presenting a paper with Haviernick when she was killed. Annie St-Arneault: A mechanical engineering student from La Tuque, Que., a Laurentian pulp and paper town in the upper St-Maurice River valley. Lived in a small apartment in Montreal. Her friends considered her a fine student. Was killed as she sat listening to a presentation in her last class before graduation. Had a job interview with Alcan Aluminium scheduled for the following day. Had talked about eventually getting married to the man who had been her boyfriend since she was a teenager. Annie Turcotte: Was in her first year and lived with her brother in a small apartment near the university. Was described as gentle and athletic — was a diver and a swimmer. Went into metallurgical engineering so she could one day help improve the environment.